UPSEE Third/ 3rd Round Seat Allotment List 2018 Results: Uttar Pradesh Technical University released the UPSEE third round seat allotment result 2018 on its official website, upsee.nic.in. The UPSEE 3rd allotment result 2018 list released on 17th july. Students those who are waiting for the UPSEE 3rd allotment list 2018 can check the details from the website mentioned below. Dr A.P.J. 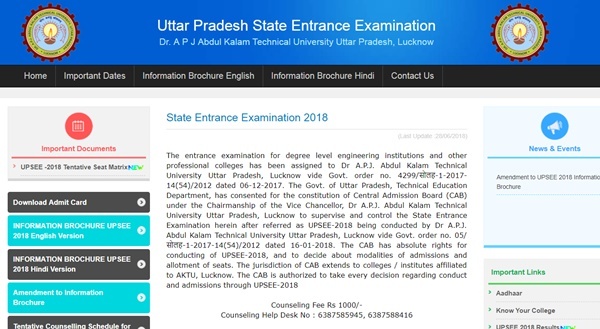 Abdul Kalam Technical University popularly known as Uttar Pradesh Technical University has conducted the admission test Uttar Pradesh State Entrance Examination (UPSEE) for aspirants seeking admission into various Graduate Degree courses such as BE/B.Tech. A huge number of hopefuls have given the test in the month of April. The Uttar Pradesh Technical University has also released the results. The students qualified the test was done with the web options entry and certificate verification rounds. The UP Technical University has opened the UPSEE third round seat allotment result 2018 on its official portal, upsee.nic.in. Candidates can check the details from 17th july, Today. Students have the possibility to get admission in best colleges of UP. In UPSEE first allotment, 800 institutes/ colleges are granting admissions for BE/B.Tech Courses in UP state. The UP Technical University has made available the UPSEE 3rd allotment result on 17th july in its official portal. Hence, candidates, those have done with the counselling and document rounds can check the UPSEE 2nd seat allotment list. Students can be able to choose their interested colleges/courses in the state of UP. The seat allotment will be done on the basis of rank obtained by the students and as per their reservation quota. On the homepage, Click on UPSEE Seat Allotment. Will there be a round 4….pls respond ASAP. Sir Mera 3rd round ka result show nhi Kar raha hai .fee payment hi maag Raha hai ..sir plz tell me what I can do. Round 3 result is same as round 2. No change in cut off is seen. Plzz tell me what is going on. 3rd round me 2nd round ke cutoff display kar raha hai…….Meri BCNO rank hai 2600 aur IET se ME ka cut off 2736 hai aur mujhe result me KNIT se CS dikha raha hai………..lagta hai 3rd round me 2nd round ka result copy kardiya hai in laparwah logon ne…….BC….these guys almost gave me a heart attack.